Sic Bo has strategies to suit all styles of gamblers: even money bets for steady gamblers maybe learning the game for the first time, decent returns for more adventurous punters and massive combination bets for high-rollers! Low-risk, steady gamblers should use the bets with the smallest edge. The best edge in Sic Bo (2.78%) is to be found with the Small, Big and Combination bets. The Small and Big bets are the closest to Evens chances in Sic Bo. This makes them ideal for our Gambling systems. Any of these systems could be used, but based on our systems tests, we recommend using the 1-3-2-4 system, though the Paroli and 1-3-2-6 are also well worth considering. The odds against this bet winning are 6 to 1 (ie you can expect to win once in every 7 bets) and the payout is 6 to 1. As a variation on a low-risk Sic Bo strategy, set aside 15 betting units and place Combination bets. Try to win two or three times. If you do this before the 15 bets are up, stop and take your winnings. This low-risk Sic Bo strategy is perfect for beginners or for those who want to limit their losses as they get familiar with the game. We've kept it simple, so you can approach the Sic Bo table with confidence. If you're looking for bigger wins, but want to take out some 'insurance', our tip is to use a Sic Bo strategy of combining bets to cover a number of results. Your winning strategy is to combine the bets so that you have four different chances of winning on each spin. Although you're losing four times your stake if you lose, the returns when you win will make up for this. 3 units on 9 and 2 units on double 1, 5, and 6. 3 units on 12 and 2 units on double 1, 2 and 6. More experienced Sic Bo player? This medium-risk Sic Bo strategy is aimed at players who are familiar with the game, but who want a little more excitement than betting just Big / Small. 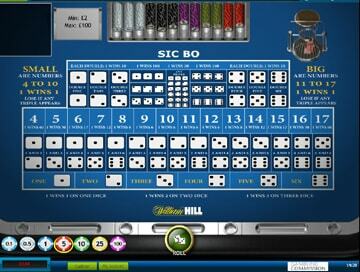 Check out our recommended Sic Bo casinos below and give the intermediate Sic Bo strategy a spin - or three! For example, a bet on 8 could include a double 1, 2, or 3 - and this is how you should stake your money. 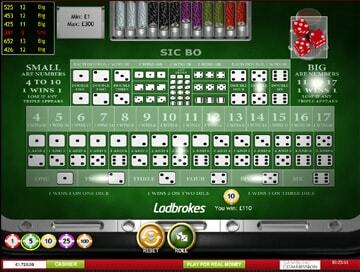 Place 3 units on 8 and 2 units on Double 1, 2, and 3. Also place a 2 unit bet on a Combination of 3 and 2, to cover the dice being 3, 3 and 2. 27 units if 8 wins, plus22 units if a double wins, plus12 if the Combination wins. Place 3 units on 13 and 2 units on Double 4, 5, and 6. 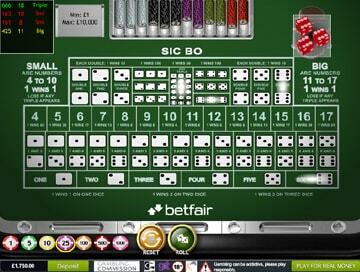 Also place a 2 unit bet on a Combination of 4 and 5, to cover the dice being 4, 4 and 5. 27 units if 13 wins, plus 22 units if a double wins, plus 12 if the Combination wins. Ready to up the stakes? This higher-risk Sic Bo strategy is designed for the high-rolling high-stakes players who is looking to risk more in order to win more. If that's you, you'll love the excitement that this strategy can generate. When multiple Sic Bo bets come up, they win BIG! 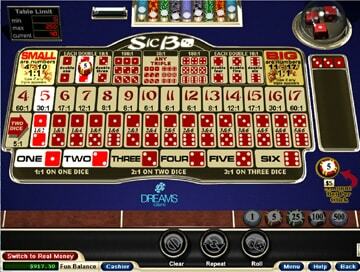 Check out our recommended Live Dealer Sic Bo casinos below and start to play for the big money.